Posted on Friday, March 29th, 2019 at 10:48 am. I wanted to honor our National Nutrition Month and all of our very important Registered Dietitians who we celebrated on RD day (and hopefully all days). Because RD’s are legitimate nutrition experts, I’m including a list of somewhat new healthful (not just nutrition) apps from my fellow RD friends that might be useful; so keep this article handy! In addition, I’m touching on sustainability and health regarding plastic usage with our food and beverages. More and more we are learning that plastic may not be the wisest choice for our planet and our precious bodies. Let’s find out why and what alternatives we can use. On the bottom of plastic food storage containers, you’ll find a tiny triangle with a number (resin identification code) ranging from 1 to 7. This number indicates what the plastic is made of. In general, the safest choices for food use are numbers 1, 2, 4 and 5. 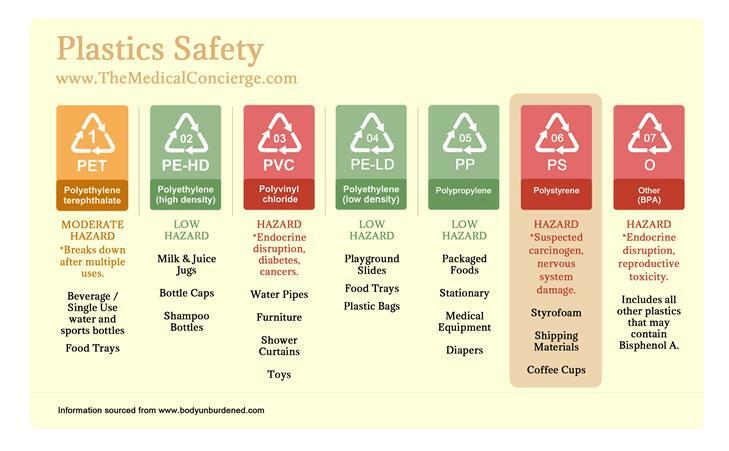 The American Academy of Pediatrics recommends avoiding plastic containers with codes 3, 6 and 7. Plastic number 3 contains vinyl or polyvinyl chloride (PVC), 6 has polystyrene and 7 can contain various plastics, such as Bisphenol-A (BPA). Common Uses: 2-liter soda bottles, cooking oil bottles, peanut butter jars, detergent bottles. Most common for single-use bottled beverages, such as water or juice. Low risk of leaching and health hazards unless used more than once. Common Uses: Detergent bottles, milk jugs, shampoo bottles, butter and yogurt tubs. Lowest risk of leaching, least toxic, no known health hazards. Common Uses: Plastic pipes, outdoor furniture, shrink-wrap, water bottles, salad dressing bottles, window cleaner and liquid detergent containers. Contains chlorine, can release dangerous dioxins and phthalates. Never burn PVC plastic, as burning will release toxins. Common Uses: Dry-cleaning bags, produce and grocery bags, trash can liners, food storage containers, most plastic wraps. No known health hazards. Common Uses: Bottle caps, drinking straws, some baby bottles. Has a higher melting point so is used for containers that come in contact with hot liquid. No known health hazards. Common Uses: Packaging pellets or “Styrofoam peanuts,” disposable cups, plates and plastic tableware, meat trays, carryout containers, egg cartons. Can leach toxins into foods. Common Uses: 5-gallon water bottles, clear plastic sippy cups, certain food and beverage containers, some Tupperware, some clear plastic cutlery, clear baby bottles, food can linings. Usually contains polycarbonate product (BPA). Though polycarbonate plastic is strong and long-lasting, it can break down over time from high temperatures and overuse. Never microwave foods in plastic food containers, including margarine tubs and restaurant carryout containers. Plastic containers from packaged microwavable meals shouldn’t be reused after their initial use; they’re safely designed for one-time-use only. Putting plastic containers in the dishwasher should also be avoided. What Else Can You Do to Stay Safe? Store and reheat food in glass or ceramic containers free of metallic paint. Purchase eggs that are sold in pressed cardboard or paper cartons. Use cling or plastic wrap only for food storage and not for reheating. Avoid storing fatty foods, like meat or cheese, in cling or plastic wrap, as these foods are the most likely to absorb chemicals from the wrap. Beware of cling wraps labeled “microwave safe.” Instead, use waxed paper or a paper towel to cover foods. Before eating plastic-wrapped deli foods, slice off a thin layer where the food came in contact with the plastic. Invest in a safe, reusable water bottle to limit chemical exposure and reduce landfill waste at the same time! According to the Environmental Protection Agency (EPA), the U.S. only recycled about 9 percent of plastic containers and packaging in 2015. Scary! This can contribute to greenhouse gas (GHG) emissions, impacting the health of the environment. 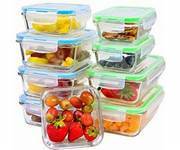 Regarding plastic food safety, pick plastic food containers wisely and limit their use to cold food storage. Choose glass or stainless steel containers for cold or hot foods. Since both can be cleaned and reused, they’re ideal for home food storage, too. 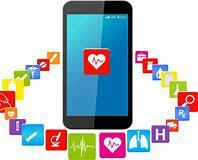 Diabetes: The Dario app is a personal diabetes management tool for tracking blood glucose levels in real-time. Fitness: Studio SWEAT onDemand has the best at home Spinning, TRX, Boot Camps, Stretch & Restore, Ab & Core, HIIT Training, Kettlebells, and more. The most popular class – Spin Sculpt, which combines calorie torching Spinning with full body toning and strengthening. Aaptiv delivers music (only) driven workouts on demand for people at all fitness levels. Meditation: Insight Timer offers more than 12,000 free and searchable guided meditations for mindful eating, self-love and compassion, sleeping quality, anxiety, stress and depression, and more. Logging Food: Bitesnap uses artificial intelligence to log meals and track calories based on a photo the user would take. Quickly Count Calories: MyFitnessPal has an impressive built-in food library. You can scan the food or search in the library which it will most likely have. I have used this one the most. To Make Healthy Choices on the Go: Food Tripping tells you about restaurants, health food stores, farmer’s markets, and coffee shops. Understanding Nutrition Labels: Fooducate lets you scan nutrition labels for a quick assessment of how healthy something really is. Dietary Restrictions: Ingredient1 quickly identifies products within your diet plan. Just apply a filter for your specific allergy (gluten, soy, dairy, etc.) and the app will locate foods in nearby stores that meet those requirements. Healthy Shopping: EWG’s Food Scores has a database of 80,000 products (not just food!) rated on a scale of 1-10 based on 3 categories: nutrition, ingredients, and processing levels. The closer the score is to 1 the better you can feel about putting that product in your cart. Jackie Newgent, RDN, CDN, is a Brooklyn-based culinary nutritionist, writer and media personality. Institute for Agriculture and Trade Policy 2008. Thank you for the valuable info Miriam! I’m going to use the plastics information for sure, and I can’t wait to check out some of the apps you’ve recommended that I don’t already use! You’re a wealth of information and I always appreciate your articles! Excellent info. I always look forward to your articles. I appreciate your view on things. Would love to hear your thoughts on myofascial release…benefits of it, how often to do it, best postures for maximum effect, release vs. strength, and maybe a few demos, etc. Just a suggestion! Thank u Miriam! I always love picking up a few new ideas when I read your articles. Thank you from Westmont, IL. That’s what I’m here for! Let me know if there are other topics of interest.